Watercolor paintings of California's birds and wildlife by René C. Reyes. In French, these birds are called Huîtrier de Bachman. 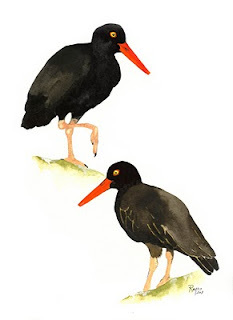 It sounds more interesting than black oystercatcher. This is a simple painting of a couple from Montana de Oro State Park at Morro Bay. "Huîtrier de Bachman", watercolor 12''x16''. Hola, Claudia. Gracias por las amables palabras. Lo siento...mi Español es terrible. I hope to paint Argentinian birds some day! Thrilled to see someone painting oystercatches. One of my favorite birds (along with sandhill cranes and all corvids). The oystercatcher painting will be available through my shop soon (link to the shop is on the right hand side under "Links and Websites"). It should be available next week. Thanks for visiting my art blog! These are a few of my watercolor paintings. In "Wa ka ve? ", the avian life of California's Central Valley is my main subject. My goal is to eventually paint most of California's birds (over 600 species!) beginning with the Central Valley. "Ma ka andah" is my collection of paintings I've done of folks I've met in Africa, Asia, and America. Enjoy my paintings!